A 34 year old Asian male has extensive hair loss from the front toward the crown with dense miniaturized hair at forelock and mid scalp. The balding area measured 212 cm2. He has good donor hair and scalp laxity. The hairs are wavy, coarse, and black. He underwent 2 sessions (strip). The first session had 3969 transplanted grafts (7951 hairs) from front to mid scalp. The second session had 2736 grafts (5808 hairs) transplanted at crown. A total of 6705 grafts (13759 hairs) were transplanted. Below are before and after photos one year after the procedure. He was placed on oral finasteride and minoxidil post op and was happy with the result. Hair restoration surgery using 6705 grafts shown from the front, viewing before and after pictures. 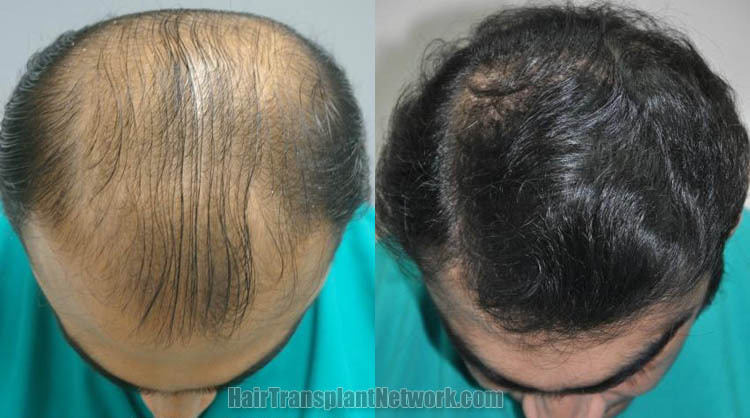 Hair transplant surgery using 6705 grafts viewed from the top, displaying before and after photos. Hair transplant surgery using 6705 grafts displayed from the left, viewing before and after photos. 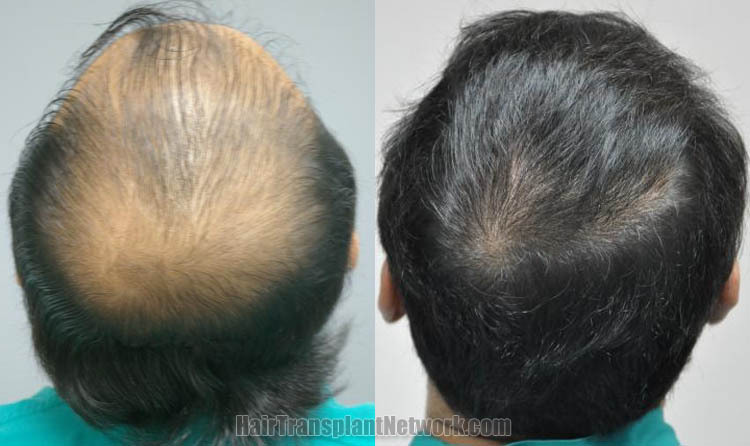 Hair transplant surgery using 6705 grafts displaying before and after photos, viewed from the back / crown.